Most people nowadays browse the internet using their mobile devices – primarily tablets and smartphones. However, we still haven’t given up on personal computers and laptops, and probably never will. As much as we want to stay mobile and constantly connected, we also feel the need to have a designated space, if you will, in which we can tune in to the world wide web from our chairs and desks. These two inherently different concepts and needs have produced a certain gap in the market that is slowly getting filled by 2 in 1 devices – devices that combine the functionality and mobility of mobile devices and portable PC components. 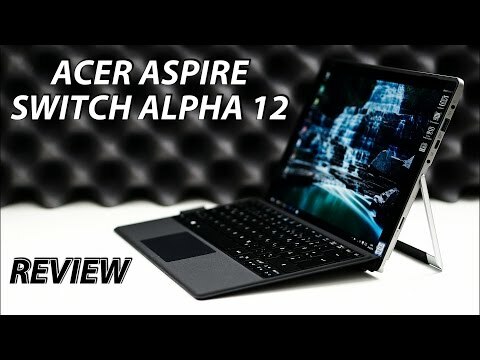 Recently, a new device of this kind has been released, the Acer Switch Alpha 12 and here’s our detailed, in-depth review of this product. Acer isn’t really known for unique design, so the Alpha looks quite similar to other 2 in 1 devices available on the market today. The chassis is made out of anodized aluminium, as well as the built-in kickstand, which has a rubberized bottom that helps keep the Alpha stable. Typing on the magnetic keyboard feels comfortable, the keyboard itself is quiet and full-sized, which makes typing on it feel even more “familiar”, so it doesn’t take a lot of getting used to. It is a well-known fact that Intel Core processors need strong cooling, which usually means most devices using these processors need fans to keep cool and fans can make quite a bit of unpleasant noise. This is definitely something that used to drive users away from these laptops but noise is not an issue with Acer’s Alpha, as it has a unique liquid cooling system. The 12 inch touchscreen looks quite nice and the screen is vibrant, beautiful and bright, while the resolution is 2160 x 1440, 216 pixels per inch. The Alpha 12 has a decent number of ports (USB 3.0 port, USB type C port, Micro SD slot), which is another plus, since not a lot of similar devices do. All in all, this is a light, cleverly designed, unoriginal machine. It’s safe to say that the Alpha has just about everything a quality 2 in 1 machine is supposed to have, including an Intel Core i7 processor, an Intel HD 520 graphics card, 8 GB of RAM and a 512 GB SSD. Battery life is probably the biggest con of this model as it lasts between 5 and 8 hours, so it is always a good idea to bring the power cord along. This is a downside that might be a turn off for a lot of users, but for devices in this price range, this is a given. To be fair, what the Alpha 12 lacks in battery life, it makes up for in performance. The camera on the rear of this device (5MP) is quite good, however the camera on the front, the 720p “selfie camera”, is below average and perhaps reminiscent of weaker smartphone cameras. This is definitely not the laptop for those who have the habit of taking high quality photos on the go with their mobile devices. 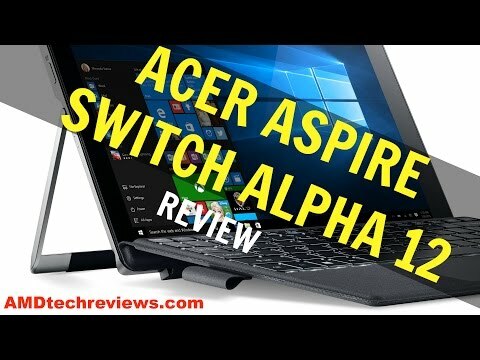 The Acer Switch Alpha 12 is a powerful machine and, arguably, has the best performance when compared to competing devices, especially those in the same price range. This is definitely a fine productivity device, as it runs pretty fast and has stunning video and decent audio. Obviously, the latest, most demanding games are a no go, but casual ones run just fine. This product comes with a few useful Acer utilities, but it is also filled with bloatware (Flipboard, Candy Crush, Music Maker Jam, Amazon, Netflix) which is always annoying. A 30-day trial of Microsoft Office will be useful for those who need to use this computer for work. Before we get into technical specifications, It’s important to note that, for a small sum, you’ll get a Stylus, which can be a powerful addition for students and professionals as it is incredibly easy to use and feels and looks like an actual pen, which is another step forward in Acer’s traditionally conservative and somewhat bland design. The Acer Switch Alpha 12 is not the strongest device of its kind, by any means, but it is definitely one of the cheapest. If you decide to purchase this product, you will not get a stunning, incredibly powerful device, but a light, fast, convenient, practical and aesthetically pleasing one. Perfect for students and professionals that are constantly on the move and need a powerful, yet light and simple machine.